Posted on 02/12/2015 02/13/2015 by Melissa Gaultier, Real Estate Specialist, Project Manager,. We all know it, solar, especially in our country, is the way to go, the future, the solution. Posted on 02/11/2015 02/12/2015 by Melissa Gaultier, Real Estate Specialist, Project Manager,. I found this data on the website http://www.macrobusiness.com.au/ and could not resist sharing it with you! Queensland parliamentarians are heavily invested in the property game. 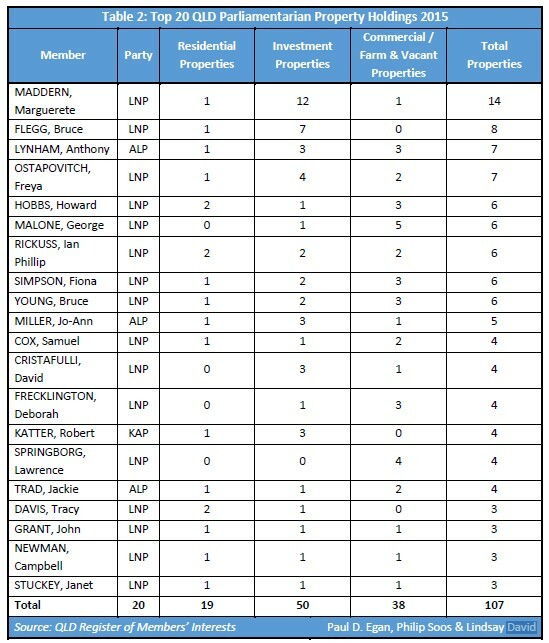 The 89 members of Australia’s only unicameral legislative assembly have stake in a total of 195 properties – an average of 2.2 properties per member, conservatively valued at around $91 million, calculated by multiplying the Brisbane median residential dwelling price of $466,500 (as at December 2014) by 195 properties.